Review: Including a spoiler alert here because while many are aware of elements about the subject of this film, I realize that some pieces may not be as well know. To avoid any angry claims I didn’t warn you…I just did. There’s been a lot of brouhaha in the press about American Sniper and the life of the man the movie is based on. Chris Kyle was a United States Navy SEAL honorably discharged from the Navy in 2009 who went on to write his autobiography that recently Oscar nominated screenwriter Jason Hall based this movie on. Accumulating 160 confirmed kills over four tours of duty in the Iraq War, he was thought to be the most lethal sniper in U.S. history. It was only after he was gunned down in 2013 by another vet Kyle was helping cope with PTSD that the mysteries behind certain pieces of Kyle’s memoir started to come to light. What you should know about the film is that while I haven’t read the source novel it was based off of, the disparities between Kyle’s account and what some would argue as the truth aren’t the focus of director Clint Eastwood’s latest film. I’m not going to speak to those that claim Kyle fabricated several sequences or events, I’m merely reporting out on the movie as it was presented to us. I did read an article recently detailing the false claims and I don’t recall any of these incidents being included in the movie. Whether that was a conscious decision on Hall’s part, creative editing after the fact, or simply not the story Eastwood and star Bradley Cooper (American Hustle) wanted to tell is anyone’s guess. What I do know is that Eastwood’s film is an edge-of-your-seat experience anchored strongly by Cooper’s revelatory performance as Chris Kyle. Arguably the most pro-American movie you’re likely to see in some time, the film bleeds red white and blue from frame one. It’s clearly established who the “good” guys and the “bad” guys are and Eastwood makes no apologies for injecting some politicized grandstanding throughout. I can’t say it really bothered me because it didn’t really stray into that insufferable right wing territory. Bulked up and burly, Cooper transformed himself from the sinewy muscled look of previous projects to an impressive built Navy SEAL that’s 100% believable. With his Texan twang in full drawl his performance is the most flesh and blood in his already impressive career. 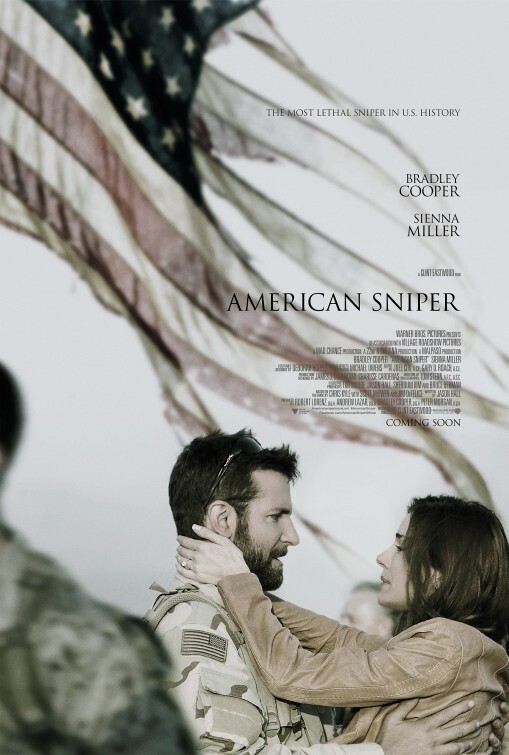 Cooper may have been nominated for an Oscar twice before (for Hustle and Silver Linings Playbook) but his nomination for American Sniper is his most warranted. He’s never been better. Unlike December’s Unbroken, American Sniper doesn’t shy away from showing the after effects of war on the men, women, children, and families of veterans after they return home. A decent chunk of the movie is devoted to showing Kyle’s adjustment to life with his wife Taya (a stellar Sienna Miller, Foxcatcher), and young children. Responsible for so many fatalities, the film looks (but doesn’t press) into the psyche of those that have to live with themselves long after their service to our country ends. To round the film out there’s a through line arc of Kyle’s multiple run-ins with a stealth sniper and while these war torn sequences are impressively staged they start to feel like a part of an action film rather than a human drama which is really what American Sniper is at its core. It’s no wonder that directors like Steven Spielberg and David O. Russell circled this project at one time or another, there’s some meat to the script and the chance to explore not just the destructive side of war but the healing piece as well. Eastwood struck out earlier in 2014 with the disastrous Jersey Boys so I was hoping he’d redeem himself with this film and it’s nice to report he found his footing with American Sniper. The 84 year old director’s laid-back style could easily have worked against the overall momentum of the film but it’s as breathless and engaging as any film he’s made before. Nominated for 6 Academy Awards, American Sniper may not hit on the full scope of Chris Kyle’s life, but what’s told is a powerfully moving tale of service and sacrifice.